Sewn With Grace: September Giveaway! All you need to provide is thread and batting! I hope you are having a fun holiday! School starts for us tomorrow. Maddie begins her senior year of high school and Taylor begins his senior year of college. Lots of excitement at my house this weekend getting ready. Blessings! Love fall and the cooler temps. Beautiful fabric. Would love to make that quilt. Thanks for a chance. Kim Diehl has long been one of my favorite designers. This ia a marvelous give away. Happy Labour Day! I am a follower, This is a fantastic giveaway. Wonderful quilt, and gosh it closes on my birthday, so.. hmm ? ?Happy Birthday to me??? LOL. I love all of Kim Diehl's books. I do not have this one so it would be fantastic to add it to my library of quilt books. Thanks for the great giveaway! This follower thanks you for the chance to win a great prize. Fall is my favorite time of the year. I love the smells of the leaves. The colors of this quilt remind me of fall. A very generous giveaway. Thanks for a chance. Oh my goodness, fabrics already cut & ready to sew! Fall is my favorite time of the year, I love the colors, and always a time for giving Thanks! Thank you for an oppprtunity to win! PS - I love Kim Diehls designs too! What a wonderful giveaway-and ready to sew! Wow. My grands have been in school a week already. I never understood why they changed the start time to before labor day. It is a rainy labor day here, so I am going to be sewing-yeah! Looks like fun! Love that book! Stop by and enter my giveaway too! I would love to win this giveaway! I am a follower, yes. I follow your blog and I love the quilt on the cover of that book. Looks so cozy for fall. Thanks for the chance to win. I love anything Kim Diehl does. Thanks for a chance at your giveaway! I love they way the white steaks are created in this quilt!!!! What gorgeous colors! Thank you for your generosity. I don't have many quilt books and would love to add this to my little stash of them and to make that cool quilt on the front would be so much fun. That is a Kim D. Book I do not have. The fabric is pretty and calm. I am a follower! I'm thinking of fall, too! Love the quilt and the book. Thanks for the giveaway. I'm ready to make a Fall quilt. Love your choice of fabrics. I am a follower. Wow Renee, what a very generous giveaway! Thanks for starting the Fall with a great quilt book and fabric. I'm looking forward to apples and cider too! We make our own - do you?? I love the warm colors in this quilt as I am starting to think fall. I am a follower of your blog and thank you for the chance to win. What an awesome giveaway! We are still having hot summer days here in Texas. Fall will come in about as month. I love your blog, especially the Sunday Scripture. Kim Diehl is a favorite of mine. Love the colors and the book. Thank you for a great givaway..
HELLO! HAPPY FOLLOWING YOU VIA BLOG LOVIN'! LOVE KIM DIEHL BOOKS-THANKS FOR A SWEET GIVEAWAY! School starts tomorrow here to. At least for my husband who is starting a new job in a school. I don't think the students start for a day or two. You lose track after your children are past school age. Your giveaway will make a beautiful quilt. This giveaway was made for me! Kim is my favorite designer and I love the cover quilt! I am a follower! Mmm... Yummy giveaway! Thanks for the opportunity! Happy to follow your blog! cant wait for fall! Those colors are yummy! Cutting is my least favorite part of making a quilt! Thank you so muck for a wonderful giveaway. I'm a follower andI'd love to make that beautiful quilt. what a beautiful quilt! I love your blog. I love your blog. I have been keepin up with ya for years now. Lovely giveaway! Love the 'Simple' books by Kim, big fan. Oh my, all kitted up ready to sew! Awesome! I am a long time follower also! That is a gorgeous quilt! What a super giveaway. Thanks for a chance to win. I am a follower. Hi Renee, Wow what a wonderful giveaway. I am a follower so please enter me-I'm dying to start a new fall quilt. This one looks lovely. What a nice give away - I'm a follower - and I don't need to go back to univeristy for another month, I just have to write a big paper so not having to go to lectuers can't really be enjoyed. So much fun! Thanks for the great giveaway! Thank you for the great giveaway. Fall colors are beginning to appear in Northern Wisconsin. The Maple's are turning red and orange. Please come fall! I love Kim Diehl and this is a lovely pattern. Fabu;ous giveaway! I love the colors of the fabric.. Thanks! Fall is my favorite season and September is the best, bringing warm days and cooler nights. What a lovely give away! What a lovely looking book. Thanks for the great giveaway. I've been following you for a little while now. I dont know how many times I've picked up this book (only to buy fabric instead :-)). How thoughtful of you to do all the cutting! What a very generous giveaway! I'm so ready for fall and the fabric colors are just perfect for creating this beautiful quilt to put on the bed when nights start getting cooler. I LOVE those colors and that quilt is just beautiful!!!!!! Thanks for offering this wonderful giveaway! What a fabulous giveaway! Fall is my favorite season. Congratulations to your two seniors; you'll have a busy spring with two graduations to celebrate! Oh this is a wonderful give away! I am a follower. I would love the book and fabric. Thanks so much for the chance. What a great give away. I love Kim Diehl and I couldn't think of a better fall quilt to make. Love the fabric choices. I am a follower. I jut dropped my son off at college for his sophomore year. Making a quilt would get my mind of missing him. I've followed your blog for a while, but have never left a comment. Love Kim's quilt and would love the opportunity to make it! I've followed your blog for a while now. 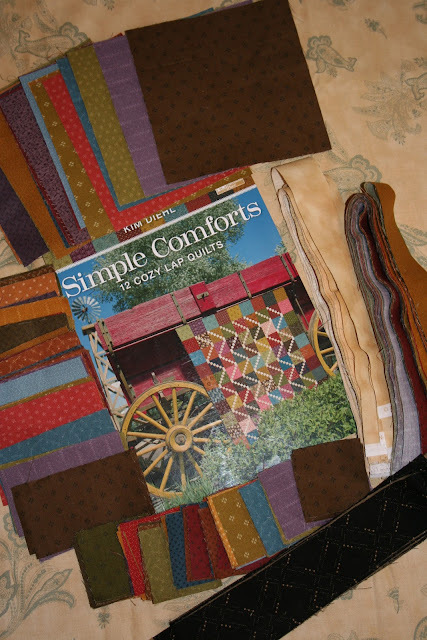 I love cozy lap quilts :) They're right up my alley! What a fabulous giveaway! I love the fabric colors! Thanks for the chance. I'm a new follower! Thanks for a chance to win these beautiful gifts! Fall is my favorite season...I love the colors and the cooler temperatures. Thanks for a chance on the wonderful giveaway! I'm a new follower. Thanks for a chance to win a wonderful prize. I love the fall too-cooler weather. Wow! This would be an amazing prize to win!! Love the colours - they look so cozy and warm. Thanks for the chance I am already following you! Thank you for your generous gift and chance to win! Can't believe your kids are "seniors" already; hope they have a great year. Yay for fall! Great giveaway, thank you! Hello, although here in Brazil is starting to spring, I would love to do this job. Thank you. Fall is my very favorite time of year...it's very calming after a hot summer, colorful and cozy...and that's my birthday season too. Your giveaway is amazing! Who doesn't love Kim Diehl! Fall is a great season! Love the quilt on the cover and would love to win! i'm a follower. I am already a follower of your blog... Love the fabric and the book. Thanks for the great giveaway!! I love your blog! You are all so happy for it to be autumn after the very hot summer. We are happy it's spring after our very wet winter! Oh, I hope I'm not too late to enter! I've been so busy this summer and not visiting blogs much. What a sweet giveaway! Thank you for the chance to win this! Oh, that's got to be hard--to be anticipating a move in the middle of senior year. I hope she weathers the change well. Your clematis in absolutely beautiful! In my corner of the country things are already starting to turn yellow. Shorter days and early fall hopefully don't mean early winter. I have just found your blog and am your newest follower!! I will be back!! This fabric surely says 'Fall' to me! School starting means falls not far behind. Love fall colors. Thanks for the giveaway! I'm a follower! I just stumbled on your site this afternoon and now it is on my favorites! what a great place to stop in for encouragement and inspiration. absolutely love the quilt!!!!!!!! Love Kim Diehl's books and love Autumn too!! Would love to win this book & fabric. Thanks for doing this giveaway!! The fabric is beautiful - thanks for the awesome giveaway!! Hope that your week was exciting and fun not stressful with all the new starts. Love reading your blog so thanks for sharing.